Thibault Brière, a corporate philosopher, stated recently that 'explaining is convincing people to do things they have not chosen'. He went on to show that choice is a fundamental driver of change, in that transformation succeeds when it results from a freely made decision to change. This raised a question: when change becomes necessary in an organization, how can the possible options be communicated to those who must change if 'explaining' is ineffective? What does it mean to communicate when one's aim is to precipitate a choice that is aligned with the common goal? I started to think about the nature of explanation and its role in corporate transformation, process optimization, the dreaded 'change management', etc. I looked at schools for inspiration. In schools, explanation is the favored mode of communication - and we are not afraid to call it that. When they 'explain', successful teachers in reality empower students to access knowledge - they make knowledge available to their students while adopting a respectful posture towards knowledge. 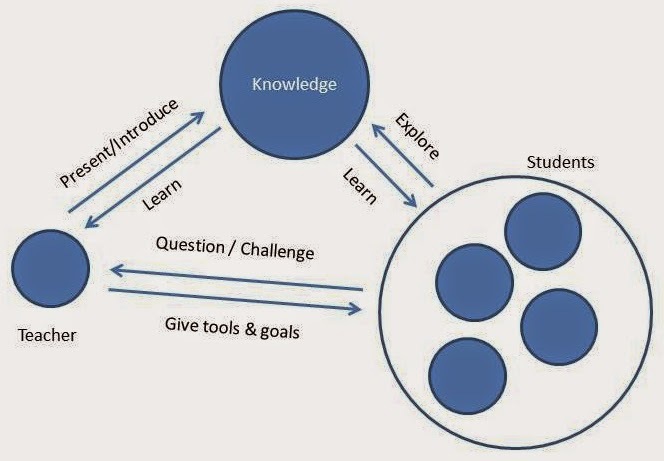 This implies that knowledge exists outside of the teacher, in a space between the students and the instructor, from where they can pluck it with the right learning tools. This makes intuitive sense; the Pythagorean theorem is Pythagoras' original brainchild, not any particular math teacher's. In this way, the teacher's ego is not part of the communication or explanation: she is a vessel who presents a greater truth - her explanatory skill comes from setting goals (find the length of the hypotenuse) and in presenting ideas and tools to lead students towards that goal (theory, drawings, textbooks, potential applications, exercises, etc.). Importantly, she sets her students on the path to using this theorem in its many advanced applications beyond planar geometry. This is in contrast to teachers who impart knowledge to passive students. These teachers are under the misguided impression that knowledge comes from them, and that they must transfer it to their students. They 'explain' the material, which is to say that they talk about formulas and rules rather than ideas and concepts. Students also retain this information, to be fair, but they cannot 'own' the concept - it remains the teacher's - and they might not be able to use it in more advanced settings. What, then, to make of the above observations in the changing corporate environment? Every organization seeking to improve itself attempts large and small transformations. Often, management will identify a new path to the future - more or less democratically, with or without external help, etc... These (path & future) must then be 'explained' to those who will transform themselves with the goal is that they will become 'engaged' and the transformation self-sustaining. The new path can be as simple as changing the way a task is performed or as ambitious as upending the business model. The more ambitious the path and/or profound the changes, the more challenging and crucial the 'explanation' will be. Whatever the reason, we have a situation akin to the teacher who doesn't realize that she didn't invent and doesn't own the Pythagorean theorem. This is particularly true because the solution to the company's crisis most likely involves the creative and clever combination of existing and new ideas, some of which might come from other countries or industries, and therefore only appear to be new. If the solution is presented as having sprung, fully formed and Athena-like, from the cranium of the almighty CEO - plus or minus the executive committee - it's unlikely to gain traction. The rank and file cannot own the solution: it is not theirs to seize, understand, manipulate, and revise or expand upon. The CEO and top management are essentially saying: "we know what's good for you, and we will now magnanimously explain it to you", treating employees like children and depriving them of initiative or ambition. 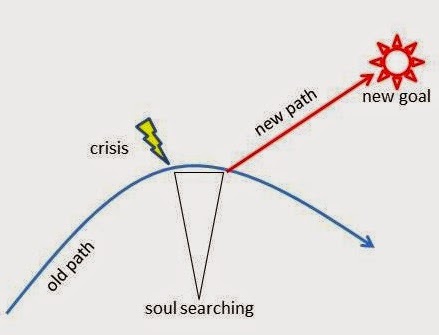 There can be no common ground, no room for an expanded understanding of the concepts underlying the solution, and nowhere for each member of the organization to carve out a unique understanding of how following this new path will solve his or her problems. This type of explanation leaves the staff with one of two options: submission or resistance. Neither is a positive dynamic on which to build a collective future. On the other hand, management can present the solution to the crisis as an idea larger than any individual or small team: an idea that exists in the space between the individuals that make up the company; an idea from which they can take the concepts that they need to reach the new goal, individually and collectively. Because this solution can be shared by all equally (it is owned by none), individuals, small groups, and indeed the whole organization, can make it theirs in the most appropriate way, as suits their activities. This is easier to do if the solution emerged from a respectful, positive, and collaborative process, but if the solution did come from a small group, it must be presented as an owner-less idea - a theorem of sorts. The staff then need help grasping the impact of the theorem on their daily activities and acquiring the skills to implement it. They can also expand on the solution, proposing innovations and taking initiative, since they are not challenging the idea's owner. Much like later mathematicians used the Pythagorean theorem to explore new kinds of mathematics, so employees can share the common elements of the solution, and find individual, unique, and innovative ways to follow it to collective success. The confusing concepts that might need clarification and the uncertainties inevitably associated with change can be addressed both collectively and individually, through exercises, training, and problem solving, much in the same way that a classroom of 13 year olds might collectively teach themselves that a2 + b2 = c2 under their teacher's leadership - and remember it for life.